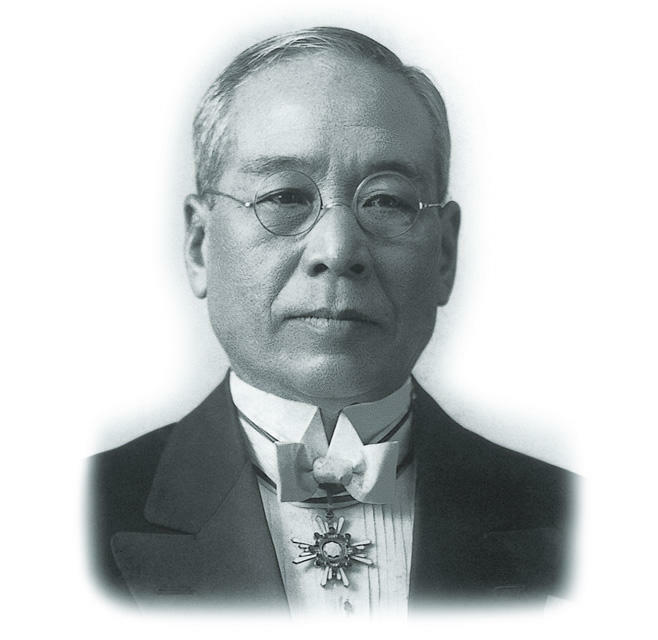 Sakichi Toyoda, the founder of Toyota Industries Corporation, was born in 1867 in Yamaguchi-mura, Fuchi-no-kori, Totomi-no-kuni (presently Kosai City, Shizuoka Prefecture). He was the first son of Ikichi and Ei Toyoda. Ikichi was a farmer who also worked as a carpenter to support his family. He was a highly skilled carpenter that many relied on. Sakichi graduated from elementary school and began working as an assistant for his father in carpentry trade. Sakichi's birth and early upbringing coincided with that period in Japanese history when the shogunate was replaced by a new government under the Meiji Emperor. This period is generally regarded as the beginning of modern Japan. In the middle of social upheavals, the entire village where Sakichi lived was plagued with poverty. From the age of 14 or 15, Sakichi began to think about ways in which he could both be useful to the people around him and serve his country. On days when there was no carpentry, Sakichi would assiduously read newspapers and magazines. He brought the local youth together in an evening study group that promoted self-learning. However, he was unable to come up with ways to contribute to society. Sakichi turned 18 in 1885. He learned of the newly enacted Patent Monopoly Act. This he studied carefully and quickly became convinced that he had found his way forward. Then and there, he decided to tap into his own wisdom and devote his utmost efforts toward invention as a means of creating something new. "Western civilization is based upon machinery. Machines are driven by steam. Steam-powered machinery requires coal which is expensive. Some method must be contrived to replace steam as the motive force." So thought Sakichi. Using trial and error methods, Sakichi experimented with various permanent and unlimited energy sources. He was not successful. In this fashion, Sakichi continued to meditate. At some point, he became interested in the hand loom used by local farm families. Sakichi thought that if he could find a way to improve the efficiency of the hand loom, it would benefit many people. Sakichi set to work. Working in a barn, he built and destroyed a number of looms. Some people began to think of him as being strange. Immersed in his efforts, this did not bother him at all. In 1890, Sakichi traveled to Ueno in Tokyo to visit the Third National Machinery Exposition. Many new machines of both Japanese and overseas manufacture were on display. Sakichi was deeply impressed. So much that he spent every day for the next month visiting the exposition, determined to understand how each of the machines worked. In the autumn of the same year, Sakichi's first successful invention was accomplished. It was known as the Toyoda wooden hand loom. Sakichi received his first patent for that loom in 1891. He was 24 years old. Unlike previous looms, the Toyoda wooden hand loom required only one hand to operate instead of two. It removed the unevenness of the woven fabric thus improving quality. It increased efficiency by 40 to 50 percent. However, the loom was still manually powered. This limited further improvements in speed and overall efficiency. So Sakichi turned his attention to the invention of a power loom. In 1892, Sakichi started a small factory in Tokyo's Taito Ward that used several of the Toyoda wooden hand looms invented by Sakichi. He did this for several reasons. He wanted financial independence to better pursue his inventing career. He needed funds to support his efforts. He also thought that he would able to confidently recommend his invention to customers by using it himself to confirm its superior performance. Fabrics manufactured by Sakichi's factory were distributed to wholesalers and enjoyed a good reputation. Sakichi managed the operation while continuing his inventing efforts. Unfortunately the factory did not do well and had to be shut down after a year of operation. Sakichi returned to his hometown. Soon afterwards, he went to visit an uncle living in the city of Toyohashi in Aichi Prefecture. He decided to live in his uncle's house and continue his efforts toward developing a power loom. To provide funds for his efforts, Sakichi invented the highly efficient Toyoda winding machine in 1894. This was an epoch-making development. To promote the manufacture and sale of his new machine, Sakichi soon established Ito Shoten Co., agent for Toyoda, in Nagoya. This later became Toyoda Shoten Co. and then Toyoda Shokai Co.
Once sales of the winding machine were on track, Sakichi turned his undivided attention to inventing a power loom. It did not take him long. In 1896, the Toyoda power loom, Japan's first power loom built of steel and wood was perfected. The shedding, picking and beat-up motions were all steam-powered. It was also equipped with the weft auto stop mechanism. The machine was relatively inexpensive and greatly increased productivity and quality. One of the first to recognize the outstanding performance of the new loom was a customer of Toyoda Shoten Co. named Tohachi Ishikawa. He proposed opening a weaving business. He and Sakichi were soon partners. They founded Okkawa Mempu Co. in Aichi Prefecture's city of Handa. The high-quality cotton cloth woven by the new loom earned a reputation for excellence. Sakichi used not only the steam engine but also an oil motor as a power source for his looms. The loom soon came to the attention of Mitsui Bussan (currently Mitsui & Co., Ltd.). In 1899, they proposed setting up a loom manufacturing company. Igeta Shokai Co. was established, with Sakichi overseeing the production of power looms as chief engineer and fully devoting his efforts to further invention. However, economic conditions were bad and the company fell on hard times, making further development more and more difficult. Sakichi ultimately left the company and opened the independently managed Toyoda Shokai Co., where he dedicated himself to invention and research. Sakichi continued his efforts to improve his machines. Looms used a bobbin to hold the weft. When the weft ran out, the power loom had to be stopped in order to replenish it. It was clear that this downtime greatly decreased operational efficiency. Sakichi became focused on the task of inventing a device that could automatically replace the shuttle when the weft ran out. In 1903, Sakichi invented the first automatic shuttle-changing mechanism that automatically replenished the weft yarn without stopping machine operation, producing the world's first shuttle-change automatic loom, Type T, equipped with this mechanism. Kanegafuchi Boseki Co. attached this shuttle-changing mechanism to its wide looms and undertook performance testing. The test results, however, were not so favorable, because Sakichi had entrusted the building and pre-testing to others. Reflecting on this experience, he developed an unwavering conviction that a product should never be sold unless it has been carefully manufactured and fully tested in the commercial trial, with completely satisfactory results. As it will be mentioned afterwards, Sakichi later traveled to the United States and Europe on a observation trip. He visited Dr. Jokichi Takamine at his home in New York. Dr. Takamine was world-renowned for having been the first person to successfully extract Taka-Diastase and adrenaline. Dr. Takamine explained that an inventor should never put his or her invention in the hands of others until it was developed as a practical product with useful social results and that this was the responsibility of an inventor. Sakichi was inspired and took this advice to heart. In 1905, Sakichi invented the Toyota power loom, 1905 type, equipped with the improved warp let-off mechanism. The loom also had a sturdy structure, built of wood and steel. This was followed in 1906 by an improved version called the Toyota power loom, 1906 type. The 1906 type greatly improved efficiency and fabric quality. In 1906, Sakichi also realized what he considered to be the other ultimate goal besides the invention of the automatic loom — inventing an energy-efficient circular loom that wove cloth through an optimal circular motion. Up until this time, looms used a horizontal reciprocal motion to move the shuttle carrying weft and weave. By contrast, the circular loom used a circular motion to move the shuttle and the weft insertion and beating were done quietly and uninterruptedly. This had never been done before. In 1907, on the recommendation of Mitsui Bussan, Toyoda’s Loom Works, Ltd. (presently Howa Machinery, Ltd.) was established with funds provided by investors in Tokyo, Osaka and Nagoya. This newly established company took over control of the plant and employees of Toyoda Shokai Co. Sakichi assumed the duties of managing director and chief engineer and continued to devote his efforts to invention and research. Nonetheless, because the new company did not allow commercial trials for which Sakichi held such a strong conviction, he set up his own individually operated commercial trial plant (later Toyoda Shokufu Kikui Kojo) in 1909. Toyoda's Loom Works, Ltd. was eventually beset by poor business results, causing Sakichi grave concern as he was the chief engineer handling invention and research and a director who could not neglect management of the company. In 1910, Sakichi resigned from Toyoda's Loom Works, Ltd. and set out on an observation trip to the United States and Europe to make a fresh start. Sakichi went to the West Coast of the United States from where he crossed the country. He visited many weaving factories in the Upper East Coast region. While amazed at the scale of these operations and their experimental facilities, he saw many weaknesses in the looms operated there and was not very impressed. Sakichi then traveled to England where he visited loom manufacturers and weaving mills in the Manchester area. This observation trip instilled him with confidence in the superiority of his original loom. He made his way back to Japan refreshed. After returning to Japan from his observation trip to the United States and Europe, Sakichi labored to raise capital and in 1911 he established the independently operated Toyoda Jido Shokufu Kojo (Toyoda Automatic Weaving Mill) as a proving ground for his inventions in the Noritake-Shinmachi area of Nishi-ward, Nagoya. This is now the site of the Toyota Commemorative Museum of Industry and Technology. In 1914, Sakichi introduced new spinning facilities at the mill based on his realization that high-quality spinning yarn was essential for the successful development of his automatic loom. At this time, its name was revised to Toyoda Jido Boshoku Kojo (Toyoda Automatic Spinning and Weaving Mill) because the mill also started spinning operations. Benefiting from buoyant economic conditions during World War I, the spinning and weaving business continued expanding year after year. With the aim of carrying out smooth business operations under these favorable circumstances, in 1918 Toyoda Boshoku (Toyoda Spinning and Weaving Co., Ltd.) was established with investments from relatives and close friends. 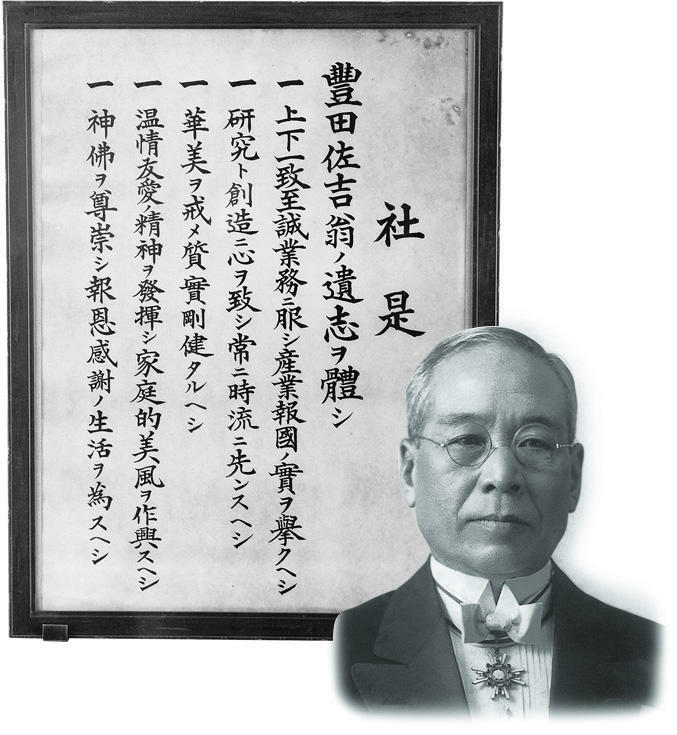 Sakichi became President but the company was effectively managed by Risaburo Toyoda, the son-in-law of Sakichi, who held the position of Managing Director. In 1918, having made sure that Toyota Boshoku was in good hands and running smoothly, Sakichi set off on a solo trip to China. He made a detailed study of the weaving industry in China, especially in the Shanghai area, before returning to Japan. In 1919, he again traveled to Shanghai with the intention to live there almost permanently. He spent a year procuring a site to build a manufacturing facility. The completed plant was huge, covering approximately 33,000 square meters (356,000 square feet). Sakichi ran the plant as a sole proprietorship for a year before reorganizing it into Toyoda Boshoku Sho (Toyoda Spinning and Weaving Works) in 1921. He there committed himself to research aimed at completing the development of an automatic loom and circular loom. Sakichi reportedly proclaimed “Open the window. It’s a big world out there!” to people around him who were apprehensive about undertaking business in Shanghai. While traveling back and forth between Shanghai and Nagoya, Sakichi worked with his son Kiichiro Toyoda and subordinates to expand efforts towards the completion of an automatic loom. Realizing the need for a test facility where a large number of the automatic looms were installed, Sakichi constructed Toyoda Boshoku Kariya Shiken Kojo in 1923 in Kariya, Aichi Prefecture. In 1924, following a stream of important patents and new invention and whilst conducting commercial trials, the non-stop shuttle-change Toyoda automatic loom, Type G, was completed. More than 30 years had passed since young Sakichi determined to devote his life to invention. The invention and perfection of his automatic loom, however, did not diminish Sakichi's passion for invention, as the completion of a circular loom continued to be his lifelong pursuit. Following the successful development of the automatic loom, on November 17, 1926, the incorporation meeting of Toyoda Automatic Loom Works, Ltd. (now Toyota Industries Corporation) was held at the head office of Toyoda Boshoku in Nagoya City. Toyoda Automatic Loom Works' establishment was officially registered the following day on November 18. Risaburo Toyoda, Sakichi's son-in-law, was named President. Kiichiro Toyoda was Managing Director. As stated in Toyoda Automatic Loom Works' Articles of Incorporation, in addition to the manufacture and marketing of spinning and weaving machinery, a major objective of the company “shall be pursuing related invention and research.” This was an unprecedented concept that originated from the experiences of Sakichi. The Type G automatic loom soon became well known not only in Japan but in the world. Focusing its attention on the excellence of the Type G automatic loom, Platt Brothers & Co., Ltd., a world-leading textile machinery manufacturer based in England, proposed a patent rights transfer. In 1929, Toyoda Automatic Loom Works concluded a patent rights transfer agreement with Platt Brothers that provided production and marketing rights of the Type G automatic loom in countries except Japan, China and the United States. The worldwide recognition of a Japanese invention and the request from a foreign company for a patent rights transfer were a truly noteworthy event in the technological history of Japan and instilled confidence in many Japanese. Sakichi Toyoda passed away in October 1930, having devoted his 63 years to invention. To commemorate the company founder, who was the spiritual support of the Toyoda companies, a monument was constructed on the first anniversary of his passing and a bust of Sakichi was erected on the fifth anniversary. In 1935, there were eight Toyoda companies and more than 13,000 workers. To express our corporate philosophy and thoroughly impress this upon all employees, the top management of Toyoda companies assembled the “Toyoda Precepts” to clearly crystallize the spirit of Sakichi Toyoda.